The New York State Professional Process Servers Association was established in 1997 at a meeting in Albany, New York. Ninety individuals from around the state converged and debated for hours to reach an outline for a state association. The group envisioned a united association that could affect a positive change on the legal support industry, the legislation that governs their businesses in the state of New York and the right of an individual to due process. 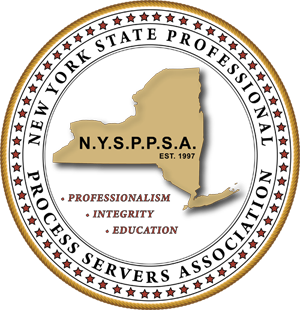 In May of 2002, NYSPPSA was rewarded with the title of Chartered State from the National Association of Professional Process Servers. We continue to grow an active organization, meeting the challenges of our industry with assertive leadership, an evolving education program, an active legislation committee, and the hard work of our diverse members. Each section of the NYSPPSA logo: The colors, text and design, were chosen for their significance. NYSPPSA: A formal and dignified abbreviation for the New York State Professional Process Servers Association. THE COLORS: The dominant gold color is our symbol is for excellence. The dark red stars stand for courage and strength. THE 62 STARS: Represent the 62 counties that make up the great state of New York. THE GOLD BRAIDED ROPE OUTLINE: A symbol that binds us together as an organization. PROFESSIONALISM – The importance of professionalism in the work place cannot be overlooked as a key to the success of this Association. EDUCATION – The purpose of education is to gain the knowledge and the skills necessary to achieve and maintain a high standard. THE OUTLINE OF THE STATE OF NEW YORK: Represents and identifies the state in which we are serving.